Our "bad guy" this week is Rod Blagojevich, the former Governor of Illinois who was convicted of federal crimes related to trying to "sell" the Senate seat that was vacated when Barack Obama became President of the United States. He was impeached and removed from office by the Illinois House and Senate. The charges that he was impeached upon were abuse of power and corruption. Blagojevich has been banned from ever again holding any public office in Illinois. It is clear that the Illinois legislature does not intend to give Rod Blagojevich any second chances. When asking myself if I would give the man a second chance, I really had to think about how I view his crimes. His 1980s hair is offensive to me, but I could probably get past that (where are the shears when you need them?). He has not been accused or convicted of any violent activity. The man simply wanted to exchange power for money. That's not so bad. Or is it? There are still a few tiny communities in the United States where you can leave your keys in your car overnight, keep the front door of the house unlocked all the time, and expect your neighbor to have your best interests at heart. However, the population in larger areas has learned that you can't always trust the people around you to respect your property or safety. That is why we lock our houses up at night, take our keys with us when we get out of the car, keep our valuables out of the sight of strangers, and have passwords for email, bank accounts, and Facebook pages. We don't know who is out there and what their intentions are, so we protect ourselves. There are times, though, that we think we know our elected officials. We feel like, during campaigns, these men and women have made their intentions clear. Prominent citizens vouch for candidates. Your next-door neighbor has a sign in his yard saying that he trusts a certain contender. And we have to put our faith in some of these people just so that our government infrastructure can function. I will admit that I do not pray for our leaders on a regular basis. Suppose you do, though. Suppose you invest a fair amount of your prayer time petitioning God on behalf of your leaders. How would you handle "abuse of power and corruption"? What would you do when your Governor, Senator, County Judge or PTA President ended up being untrustworthy? Would you lock power away from those whose job it is to use that power on your behalf? Decision makers cannot act if they are given no authority. Treasurers cannot pay the bills if they do not have permissions to use the bank accounts. But do you really want to put a car thief in charge of the motor pool? This leads me back to the question we have asked before in the Never Beyond series: does giving someone a second chance mean having to give them the ability and power to commit the same offense again? God forgave Moses for disobedience, but He still told Moses that he could not go into the Promised Land because of his sins. Jesus forgave the thief hanging on the cross next to him, but He didn't take that thief off of the cross. I don't know that grace means acting as if nothing wrong happened. There is no need for grace, is there, if no offense was committed? I also know that people who lie, cheat, and steal can turn their lives around - in a BIG way. Because I have a BIG God who gives out AUDACIOUS grace, I believe that Rod Blagojevich can turn his life around. He can become a productive member of society. He could be standing next to us showing grace to the next sinner who needs a second chance. He could truly become a "poster child" for second chances. And if he shows up at my place (wow, don't we already have enough politicians in Texas with that haircut? ), wouldn't it be great if I could welcome him by saying, "I've been praying for you"? I'm so glad I'm following so I can tell you: Blago quite won me over on Celebrity Apprentice. I said so many times, that season: I really like him. I'd like to have coffee with him. 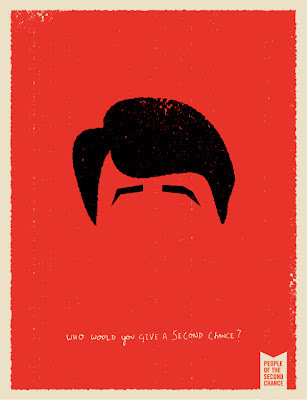 I'd definitely give Blago a second chance. @Brandee Shafer I'm sure that Sarah Palin could use the extra prayers. I think God loves it whenever we are moved to pray for someone other than ourselves. Great thoughts Carolyn...I always enjoy joining you each week as you wrestle with each of these posters out loud with us. I do not do a good enough job of praying for our leaders. Thank you for the challenge and conviction.